Poole Pottery Carol Cutler Dish Shape 82 – Perfect Christmas Gift! We currently have a Carol Cutler Poole Delphis range spear dish in our Perfect Pieces Poole Pottery section, perfect for that special Christmas present! This Delphis range dish is brightly coloured in vivid oranges and yellows and has been decorated by the very popular and hugely collectable Carol Cutler. It is Poole shape number 82 often called a Spear dish or Sweat dish. This particular piece of Poole pottery can be dated, c1969-1975 – a classic piece from that era. This Poole pottery piece would be sent to you by Royal Mail Special Delivery. This service normally is guaranteed next working day delivery by 1pm but with the current weather situation Royal Mail has suspended this guarantee although many parcels are being delivered in this time. REMEMBER – If you order before 3pm we’ll despatch THE SAME DAY! This entry was posted in Gift Ideas and tagged Carol Cutler, Christmas Gift, Poole Delphis, Poole Pottery, Poole Shape 82, Poole Spear on December 17, 2010 by Perfect Pieces. This tall Troika vase is called a rectangular vase and is a piece from the textured range that the Cornish pottery produced – this means all sides are of a textured finish! This particular Troika vase has been decorated by Alison Brigden who worked at the pottery in Newlyn in Cornwall, England. There are several new additions to our Troika pottery section so why not take a look and get your Christmas shopping sorted early?! This entry was posted in New Stock and tagged Alison Brigden, Christmas Gift, Troika Cornwall, Troika Pottery, Troika Rectangular Vase on November 9, 2010 by Perfect Pieces. Looking for that perfect coffee mug or beer tankard? Why not try an original Denby Pottery tankard? If you’re looking at buying someone that perfect mug for their coffee (or beer!) then why not take a look at our selection of Denby pottery tankards? Denby pottery’s history dates back to the early 1800s and unlike many of its competitors, Denby is still producing high quality table and decorative wares in the UK today at its Denby, Derbyshire factory. These tankards were all designed by the well-known and collectable Denby designer Glyn Colledge and are a unique and usable alternative to the brand new mugs and beer tankards you are probably drinking out of at the moment. Christmas Eve 2008) AND we currently have FREE UK postage and packaging on all our products making them an even better buy. Take a look at our selection of Denby Pottery Tankards now, click here. This entry was posted in Gift Ideas and tagged Christmas Gift, Denby Pottery on December 12, 2008 by Perfect Pieces. If you’re looking for a Christmas gift for someone special then the Royal Doulton Winnie The Pooh Disney figurine “I’ve Found Somebody Just Like Me” is a perfect present. The adorable Winnie The Pooh continues to capture people’s hearts along with his friends Piglet, Eeyore, Owl and of course Christopher Robin. Royal Doulton produced a range of china Disney figurines and this particular one, I’ve Found Somebody Just Like Me, is Royal Doulton model number WP22. It was produced as part of the Winnie The Pooh Royal Doulton Series in 1999 and is a limited edition of only 5,000 pieces. The model comes complete with its matching wooden base that the figurine stands on. If you have any questions about this super Royal Doulton piece please do not hesitate to – contact us. And remember…all our Royal Doulton prices include FREE UK postage & packaging! 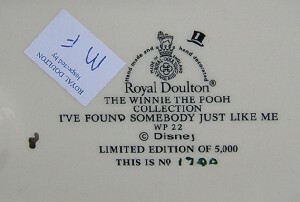 This entry was posted in Gift Ideas and tagged Christmas Gift, Royal Doulton, Winnie The Pooh on December 8, 2008 by Perfect Pieces.